“We, the members of the group known as “The Circle of Justice” hereby give you notice that you are to cease any statements, implications or representations that you represent our group in any capacity or have any association with our group. We also hereby give you notice to cease the use of the name of The Circle of Justice or the name of any individual of the group in any association with you in any book, newspaper, on the internet, television or through any medium or in any conversations or representations with anyone. A Public Order revoking the authority of Canada’s RCMP and replacing them with common law peace Officers was proclaimed today at the site of Canada’s most heated environmental protest in years. 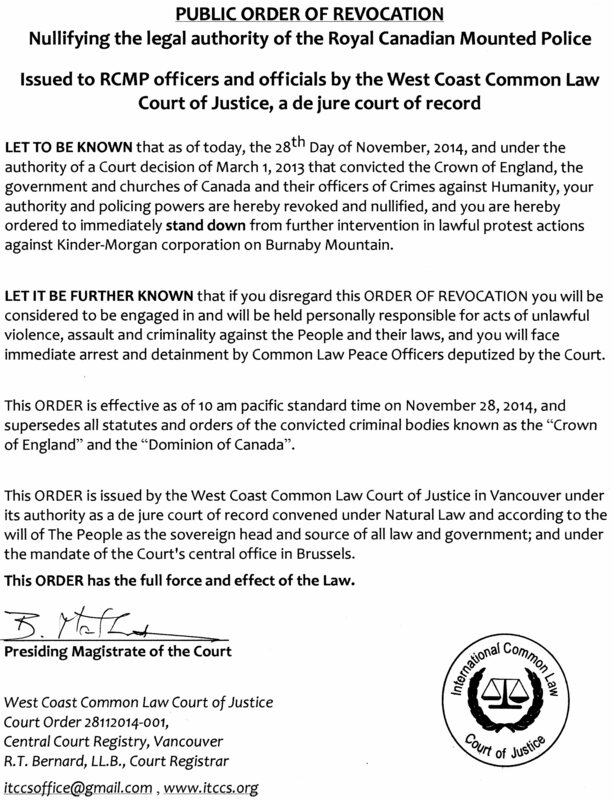 The Order was issued by the Vancouver-based West Coast Common Law Court of Justice in the wake of illegal arrests and violent “gestapo tactics” by RCMP officers against peaceful protestors opposing the desecration of forests on Burnaby mountain by the Kinder-Morgan corporation. “Let it be known that as of today, the 28th Day of November, 2014, and under the authority of a Court decision of March 1, 2013 that convicted the Crown of England, the government of Canada and its officers of Crimes against Humanity, your authority and policing powers are hereby revoked and you are ordered to immediately stand down from further intervention in lawful protest actions against Kinder-Morgan corporation on Burnaby Mountain. Copies of the Stand Down Order were given to RCMP officers yesterday and today and delivered to the RCMP Superintendent in Ottawa by Court appointed Peace Officers. A special announcement from the Republic of Kanata and Common Law courts in Canada, describing how the RCMP and B.C. Supreme Court have bowed to the common law Revocation Order nullifying “crown” authority in the Kinder-Morgan environmental dispute in Vancouver. The common law works: join our movement and reclaim our nation. Issued 29 November, 2014 on liberated territory of the Republic of Kanata. I happen to notice that Dani from Removing the Shackles calls Kevin Annett a “total fraud”, what’s your thoughts on that one? Having said that I do not discount all of the reports from Kevin Annett because the Roman catholic church has hidden murders, and many other sources have given documented evidence, and we know over the centuries the torture, abuse and murder of people of color in the Americas… He may be falsely building his ego in taking undeserved credit for some events, but I do not have evidence of that. I leave it as an open question. Today we can not trust anything from institutions and their employees, and that skill of questioning and withholding belief even toward the alternative and aware media is healthy for our discernment moving forward through the Matrix. Regardless of how many people will misinform knowingly or unknowingly we will not trust the institutions because they have no and deserve no authority over anything nor over anyone. Personal sovereignty is the great effort that everyone must recognize, even if they refuse to nurture and exercise it in themselves, at minimum recognize personal sovereignty in others who claim it. I see a future major dichotomy between the order-followers-issuers attacking the noncompliance-free will-personal sovereigns. 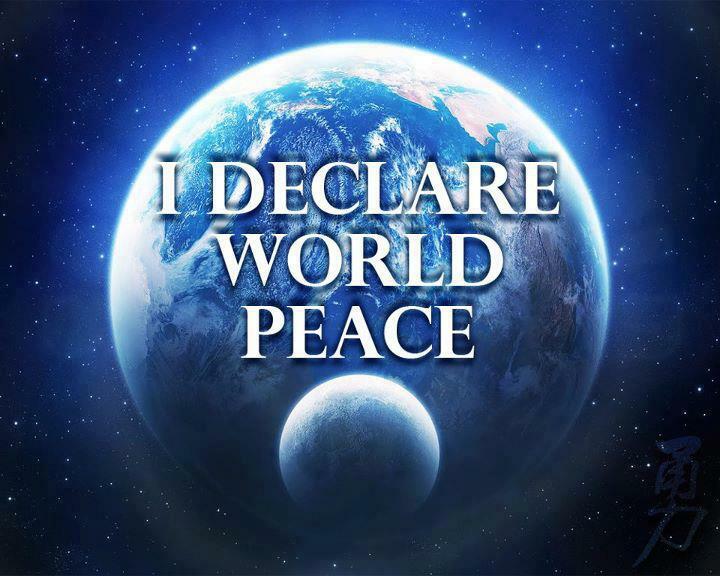 The many issues and sub-issues will have to be parked as institutions harsh attempts to enslave humanity and re-exert their NWO that exist today but is being revealed to all who are willing to face that truth. Jordan Maxwell said that the masters do not take kindly to their slaves saying “no”. I am back to seeing some “Event” before TRUE CHANGE on the grand scale of the Matrix. Will enough People walk away from corporate-government goods and services? I wish to live to see it. Many people refuse to look and refuse to face the truth, they are “order followers”. They refuse to let go of their false beliefs and assumptions about governments. Too true… It was Mel V, you’re right, it wasn’t Dani.Personally, I haven’t had one problem with Kevin Annett’s reports and efforts myself. At least he’s trying to make a difference and actually doing it. I agree that the crimes of the Church have been hidden far too long, everybody knows, but few talk about it. I’ll continue to post updates about his efforts as well. Our choices act like a boomerang. Rather than denigrate someone, like several way showers lately, find people who share your passion, values, and take peaceful collective action toward positive change. This permits others to do the same; a physics phenomenon known as collective resonance, or entrainment. I will be brief, as this is something I blog about often and it is a intricate weave of deception and manipulation World Matrix we live in. Thus the challenge is ever present to not be entangled in the weaver’s spell regardless of what friendly or trusted source it comes from. Most fundamentally the weaving spell begins with language itself as a manipulation of the mind, with the most common result of individuals unwittingly propagating the control program. Then the weave becomes more intricate with personal mistakes and harmful associations, and some people will think that a person can never change their bad behaviour and learn from their past mistakes. You have seen my comments that this is “messy”. Many times I almost stopped writing, and abandon the global dialogue; however my spirit refuses to yield to this current meme and Age of Deception. Firsthand experience is vital in this transition – What we personally think-do-say and how we respond takes practice with focused conscious intention to advance ourselves out of the Matrix. Then more People collaborate and cooperate – this resonates with take action for positive change, D.I.Y., P2P, Self Organizing community phenomena. That is the short-hand version of my vision for the transition and planetary healing.